James Man was born on 22 May 1783 in the parish of St. Dunstan in the East, London, the younger son of James and Sarah (Roberts) Man, and was baptized on 2 July 1789 at St Dunstan in the East, London. He married Frances Margaret Holmes on 9 October 1821, by license, at St. Mary-at-Lambeth, Lambeth, Surrey. James died on 5 March 1842 at 5 Princes Place, Kennington Road, Lambeth, Surrey. 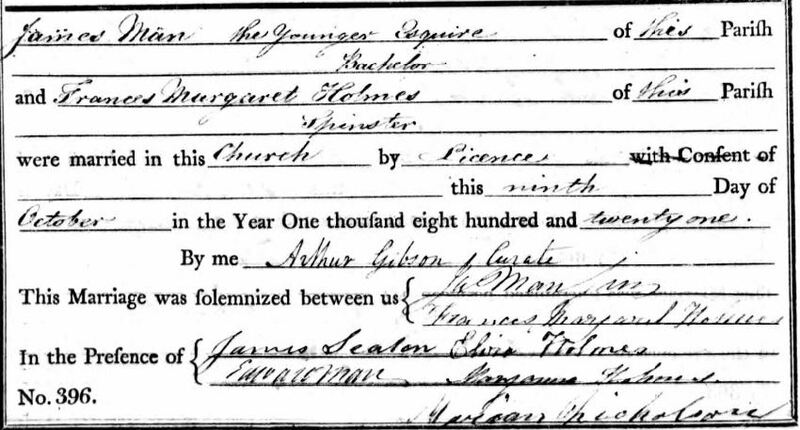 Frances Margaret Holmes was born on 17 October 1799 in Westminster, Middlesex, the older daughter of Daniel and Elizabeth Catherine Holmes, and was baptized on 17 April 1805 at St Paul Covent Garden, Westminster. She died on 17 January 1877 at 122 Kennington Park Road at Lambeth in Surrey. [References: James’s birth and baptism – FHL Film # 0396188; his marriage – FHL Film# 1041641; his death – copy of death certificate; Frances’s birth and baptism – FHL Film # 0845241. Frances’s death the Free BMD. Picture above: St Dunstan in the East] Below the registry of James’s baptism. William L. Man was James and Frances M. Man’s first cousin once removed, not nephew. James and Frances have been found on the 1841 census, Frances and her daughter Elizabeth Sophia along with William have been found on the 1851 census (as transcribed above). The two women are also on the 1861 census and the 1871 census. 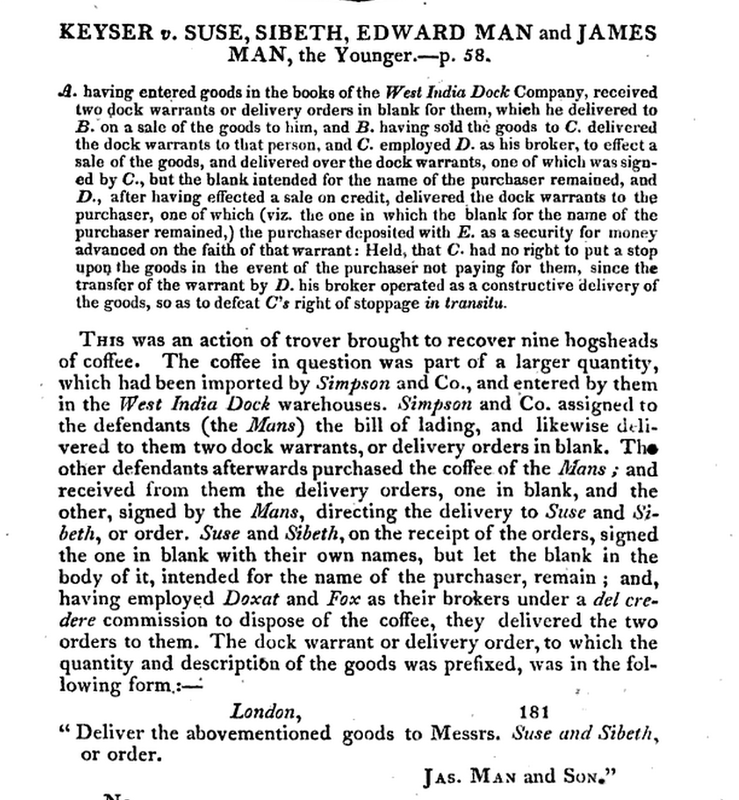 Edward Man (James’ brother) became a partner in the firm with his father in 1805. The company at that point was called James Man and Son. James, Jun. became a partner in his father’s and brother’s brokerage firm in 1808 at which point the firm became known as James Man and Sons. In 1819 by agreement among James and his sons the company became known as Edward and James Man. (Up until 1870 the law required that the name of a partnership had to list all the partners). By 1870 the firm was known as E. D. & F. Man standing for the two brothers Edward Desborough and Frederick and has remained the same name until the company split and the financial publicly traded company became The Man Group. The commodity trading company retained E. D & F. Man as its name. 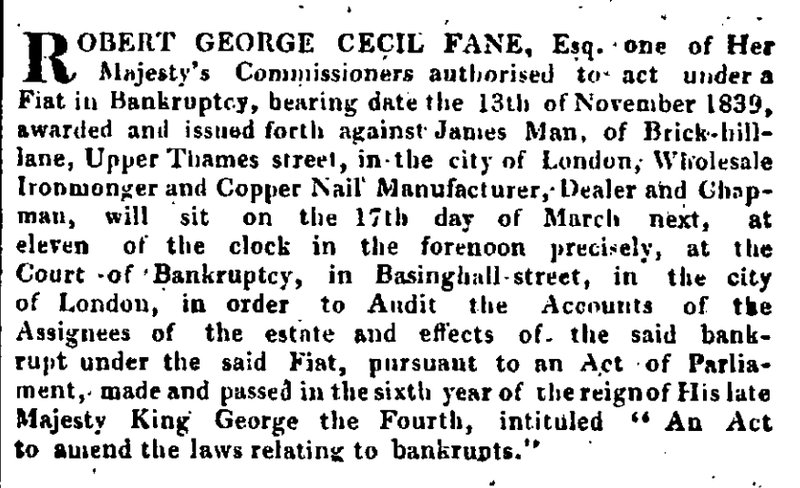 From The Jurist (1839) . 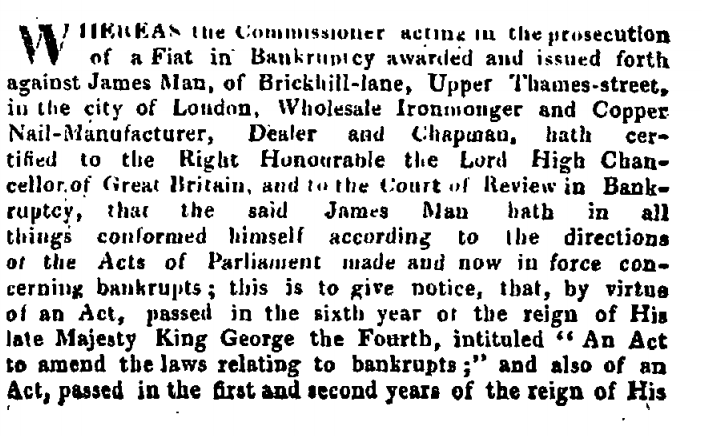 Below is the death notice for James in The Times of 8 March 1842. Man V. Ricketts. May 30, July 3, 1844. A suit was instituted by the creditors’ and official assignee of a bankrupt. The creditors’ assignee died before decree, the official assignee died after decree, and a new official assignee being appointed, his name was, on motion, substituted as Plaintiff in the suit. This bill was filed by James Man, the creditors’ assignee, and George Lackington. the official assignee, of a bankrupt. James Man died in March 1842, leaving Lackington surviving him, and a decree was made in the cause on the 22d of February 1844. In March 1844, after the decree had been pronounced, but before it had been entered, Lackington, the official assignee, who was then the sole Plaintiff, died, and on the 2d of April 1844 William Turquand was appointed official assignee in room of Lackington. A motion was now made that the name of Turquand might be henceforth substituted in the place of Man and Lackington, or of Lackington, in all further proceedings in these causes, in the same manner as if Turquand had been originally a party thereto. Mr. Hallett, in support of the motion. Mr. Kent, contra, for the Defendant T. B. Ricketts, objected to the form of the notice of motion, it not stating on whose behalf the motion was made, and contended that this section did not apply to the present case, and that a supplemental bill was necessary. The Master Of The Rolls [Lord Langdale]. I think that the Vice-Chancellor of England has made orders of this description, and I will take an opportunity of looking at them. The Act provides that the estate shall vest in the new assignee, and that the new assignee may be substituted by “suggestion.” I should have felt some difficulty as to the proper mode of giving operation to the direction as to the suggestion, but for the orders of the Vice-Chancellor of England. The Master Of The Rolls ordered the name of Turquand to be substituted in the place of Lackington deceased as a Plaintiff in the suit; and that the suit should be prosecuted in the same manner as if Lackington had been originally a Plaintiff therein. In Edward Garnet Man’s (EGM) school boy diary Vol. 1 written in 1850-1851 the following entry can be found: ‘September 27 1851, had a letter from Miss Frances Man with an invitation for Monday. Wrote to say we could not come.’ And later on in the diary Edward writes: ‘Miss Frances Man staying at Mrs. Laurence, Lee Grove, Blackheath’. What is puzzling is that no ‘Miss Frances Man’ alive in 1851 presents herself as an obvious candidate for this reference. However Ed Man has pieced together the following which shows that this Miss Frances Man was to the wife of James Man. 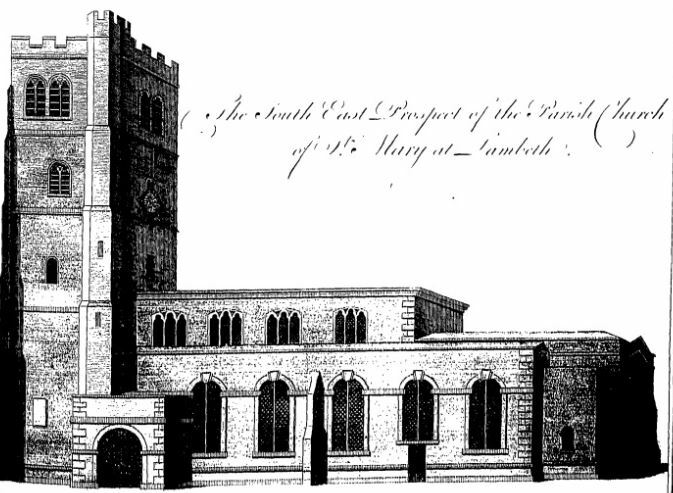 From the parish register of St Dunstan-in-the-East, London: James Man, Jnr., son of James Man and Sarah Roberts, born 22 May 1783 and baptized 2 July (see image above). He married Frances Margaret Holmes on 9 October 1821 by license at St Mary-at-Lambeth, Lambeth, Surrey. From James Man’s Family Bible: among sponsors at the christening of Harriot Man [dau. of Edward & Georgiana Man] on 26 Jun 1821 Margaret Frances Man [therefore James and Margaret married before 1821]. From Bishops’ Transcripts of St Mary, Lambeth, Surrey: James Nisbet, son of James & Frances Margaret Man, baptized on 5 September 1823. Same source: Elizabeth Sophia, dau. of James (Jnr.) & Frances Margaret Man, baptized on 14 January 1825. From “The House of Man”: The partnership of Edward and James Man (Jnr.) was broken in 1828 when James started his own business as a wholesale ironmonger with premises in Brickhill Lane, off Upper Thames Street. From James Man’s Family Bible: among sponsors at the christening of James Lawrence Man [son of Edward & Georgiana Man] on 16 December 1818 – James Man Junior and Thomas Lawrence. So! From these 11 pieces above put together by Ed Man, what conclusion can be drawn about Frances Man mentioned in EGM’s schoolboy diary? Therefore ‘Miss Frances Man’ mentioned in Edward Garnet Man’s diary is James’s widow (he died in 1839 at Penzance). She would have been about 70 in 1851, but we know from Mary Awdry’s letter that she lived to an old age. Mary was born in Kennington in 1852 so would have known her as a young girl. One other thing that is clear from this is the fact that the various members of the two branches of the Man family (Henry and James) were well acquainted with each other and communicated and visited back and forth. The only strange thing is that the descendants of Frederick Man were not acquainted with the descendants of Edward Desborough Man, but were in touch with the descendants of Edward Garnet.